“Movies from the 1950s” by Ted Jackson, a member of the Rochester Chapter for fifty years. He was employed 37 years by Eastman Kodak as a statistician, retiring in 1985. Currently Ted is writing a book for the Chapter entitled "Erie Railroad - Rochester Division." His show will be presented on DVD, from 16mm movies shot in the 1950's. One of them will feature branch line Canadian railroading in steam. Another will feature first-generation diesels from Rochester area. The show is "A History of Dining Car Operations on the Erie, Lackawanna, and Erie Lackawanna" - a look at the origins and growth of dining car operations as well as how hundreds of meals were served every day through the end of service as well as the effort to recreate the dining car experience today. Tim Stuy is currently the President of the Erie Lackawanna Dining Car Preservation Society (http://www.eldcps.org/). He worked briefly for the Communications & Signals Department of Conrail. He was membership chairman of the Erie Lackawanna Historical Society 1985-1988. Tim founded the NYS&W Technical & Historical Society in 1988 and served as president for 5 years. Tim founded the New Jersey Midland Railroad Historical Society in 1994 and served as its president from 1994 to 2008. Rochester Chapter NRHS meetings are open to anyone, so please pass the word and bring a friend! Meetings usually start at 7:00... browse our Chapter Book Store before the meeting starts! We meet at the 40&8 Club, 933 University Avenue, Rochester, NY 14607. The Rochester Chapter of the National Railway Historical Society is pleased to announce that it will hold its February 2010 general membership meeting this coming Thursday evening, February 18th at the 40&8 Club. The meeting will feature "A History of Dining Car Operations on the Erie, Lackawanna, and Erie Lackawanna" - a look at the origins and growth of dining car operations as well as how hundreds of meals were served every day through the end of service as well as the effort to recreate the dining car experience today by Tim Stuy. Tim is currently the President of the Erie Lackawanna Dining Car Preservation Society (http://www.eldcps.org). He worked briefly for the Communications & Signals Department of Conrail. He was membership chairman of the Erie Lackawanna Historical Society 1985-1988. Tim founded the NYS&W Technical & Historical Society in 1988 and served as president for 5 years. Tim founded the New Jersey Midland Railroad Historical Society in 1994 and served as its president from 1994 to 2008. Visitors are always welcome! You do not need to be a Rochester Chapter NRHS member to attend. The meeting starts at 7PM with some time to socialize and peruse the Rochester Chapter's book store. You can also check out our railroad library co-located at the 40&8 Club. A short business meeting will take place between 7:30PM and 8PM with the show starting around 8:15PM. The meeting is held at the 40&8 Club which is located at 933 University Avenue(Across from the Gleason Works between Culver Road and Goodman Street) in the City of Rochester. More information is available on our website, www.rochnrhs.org. We hope those in the greater Rochester area will come out to see this great program. The Rochester Chapter of the National Railway Historical Society is pleased to announce that it will hold its March 2010 general membership meeting this evening, March 18th at the 40&8 Club. The meeting will feature a photo program called Railfanning in Black & White. I, Chris Hauf, will be the presenter for this evening. Our original speaker had to reschedule his CNJ show for another time. My show will track my railfan photography in the late-1980s as seen through my B&W film camera. The images I am presenting have seen carefully scanned and will be digitally presented. They include mostly the railroads encircling my hometown of Montclair, NJ with some images from NY State and PA tossed in as well. Visitors are always welcome! You do not need to be a Rochester Chapter NRHS member to attend. The meeting starts at 7PM with some time to socialize and peruse the Rochester Chapter's book store. You can also check out our railroad library co-located at the 40&8 Club. A short business meeting will take place between 7:30PM and 8PM with the show starting around 8:15PM. The meeting is held at the 40&8 Club which is located at 933 University Avenue(Across from the Gleason Works between Culver Road and Goodman Street) in the City of Rochester. More information is available on our website, http://www.rochnrhs.org. The Rochester Chapter of the National Railway Historical Society is pleased to announce that it will hold its April 2010 general membership meeting this evening, April 15th at the 40&8 Club. The meeting will feature a program on the Buffalo Creek Railroad with Stephen M. Koenig. The program will cover some of the highlight of one of Western New York's most successful shortlines and unique facts that were not well known by most people. He will also cover some interesting facts on their massive boxcar fleet. Steve will also have Z scale Buffalo Creek Boxcars available to commemorate the 10th anniversary of the club. The Rochester Chapter of the National Railway Historical Society is pleased to announce that it will hold its May 2010 general membership meeting this evening, May 20th at the 40&8 Club. The meeting's program is Member Slide Night where we welcome both members AND guests to share a few of their slides or digital images with the audience. The Chapter will have both a Kodak Carousel projector available for your slides (please have them in a Carousel tray to make changeovers easier) and a laptop/LCD projector to share your digital images. We ask that people who wish to display try to restrict their presentation to 15-20 images. This will allow for everyone to be able to present their stuff within a reasonable amount of time. The Chapter will also have tables setup and welcome people to bring photographic prints, railroadiana, or models to share with group as well. We hope those in the greater Rochester area will come out to see and participate in this month's program. As a heads up, the June, July & August Chapter meetings will be held at the Chapter's Rochester & Genesee Valley Railroad Museum. 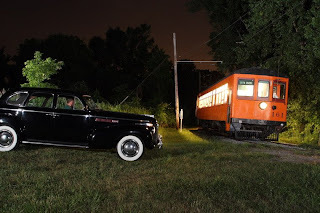 The meetings will feature operations of the museum's railroad collection, and we are also hoping to hold at least one night photo session during one of the meetings as well for interested photographers. The Rochester Chapter of the National Railway Historical Society is pleased to announce that it will hold its July 2010 general membership meeting this evening, July 15, at its Rochester & Genesee Valley Railroad Museum in Rush, NY. The meeting starts around 6PM and the program will feature operations of the museum's railroad equipment collection. there may be a brief business meeting at some time during the evening. Visitors are also welcome to check out the progress on the variousprojects underway in the museum's shop along with the recent progress on thebuilding of a new siding to house the museum's ex-New York Central Empire State Express passenger car set. Visitors are always welcome! You do not need to be a Rochester Chapter NRHS member to attend. As a heads up, the August meeting (August 19th) will also be at the R&GVRRM. Plans are in the works to hold another night photography session for interested photographers. Here are some of the results from the past two years' events. Thanks and we hope to see you out! The Rochester Chapter of the National Railway Historical Society is pleased to announce that it will hold its August 2010 general membership meeting this Thursday, August 19, at its Rochester & Genesee Valley Railroad Museum in Rush, NY. The meeting starts around 6PM and the program will feature operations of the museum's railroad equipment collection. there may be a brief business meeting at some time during the evening. Visitors are also welcome to check out the progress on the various projects underway in the museum's shop along with the recent progress on the building of a new siding to house the museum's ex-New York Central Empire State Express passenger car set. The August meeting will feature a night photo session for interested photographers. The museum is asking night session participant donate $10 to the museum's Donate-A-Ton fundraiser. The shoot is planned to take place along the railroad so the only way to reach the site is by train. The train will depart the Industry depot around 7:45PM. Participants will need a camera capable of a bulb setting, a cable release, a tripod and a flashlight. Thanks and we hope to see you out. The Rochester & Genesee Valley Railroad Museum/Rochester Chapter NRHS are pleased to announce that they will hold their general membership meeting this evening, September 16th at the 40&8 Club. The meeting will feature a program on the Finger Lakes Railway by Deb Najarro. Visitors are always welcome! You do not need to be a member to attend. The meeting starts at 7PM with some time to socialize and peruse the Museum's book store. You can also check out our railroad library co-located at the 40&8 Club. A short business meeting will take place between 7:30PM and 8PM with the show starting around 8:15PM. The meeting is held at the 40&8 Club which is located at 933 University Avenue(Across from the Gleason Works between Culver Road and Goodman Street) in the City of Rochester. More information is available on our website, http://www.rochnrhs.org. The Rochester & Genesee Valley Railroad Museum/Rochester Chapter NRHS are pleased to announce that they will hold their general membership meeting this Thursday, October 21st at the 40&8 Club. The meeting will feature 16mm films of the New York Central Railroad by museum volunteer, Peter Gores. Visitors are always welcome! You do not need to be a member to attend. The meeting starts at 7PM with some time to socialize and peruse the Museum's book store. You can also check out our railroad library co-located at the 40&8 Club. A short business meeting will take place between 7:30PM and 8PM with the show starting around 8:15PM. The meeting is held at the 40&8 Club which is located at 933 University Avenue(Across from the Gleason Works between Culver Road and Goodman Street) in the City of Rochester. More information is available on our website, http://www.rgvrrm.org. The Rochester & Genesee Valley Railroad Museum/Rochester Chapter NRHS are pleased to announce that they will hold their general membership meeting this Thursday, November 18th at the 40&8 Club. The meeting will feature a presentation by local railroad historian, Sheldon King. on the Lehigh Valley Railroad's Auburn Branch. Visitors are welcome! You do not need to be a member to attend. The meeting starts at 7PM with some time to socialize and peruse the Museum's book store. You can also check out our railroad library co-located at the 40&8 Club. A short business meeting will take place between 7:30PM and 8PM with the show starting around 8:15PM. The meeting is held at the 40&8 Club which is located at 933 University Avenue(Across from the Gleason Works between Culver Road and Goodman Street) in the City of Rochester. More information is available on our website, http://www.rgvrrm.org/. For those who may have not made it out this year for Railroad Day on Sunday, June 19, here is a set of photos by our museum photographer Chris Hauf. Enjoy the photos and thanks to everyone for volunteering their time to make this another great event for our two museums. See our calendar of special events scheduled throughout the season! The Rochester and Genesee Valley Railroad Museum will be hosting an open house on the evening of Thursday July 21st. Time will be 6:00 - 9:00. Stop out and take a look around. We have also REDUCED our annual membership to a mere $25.00. If you join know your mebership will extend through the end of 2012! Everyone is invited to the Rochester & Genesee Valley Railroad Museum's August meeting, held at Industry Depot at 7:00pm on Thurday the 18th. After a brief business meeting, we will be operating train rides up and down our demonstration railroad. You don't have to be a member to come out an enjoy a summer evening on the rails! On Sunday, August 20, we will be hosting our annual Diesel Day event! Enjoy our fleet of operating vintage diesel locomotives! Your trip begins at New York Museum of Transportation on one of their vintage trolleys. You will then transfer to one of our diesel trains to complete your trip down to Industry. 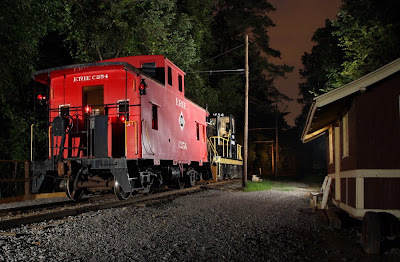 Your ticket is good for rides all day, so enjoy a seat in one of our restored cabooses of enjoy a supervised ride in the cab of one of our locomotives! One day only! No reservations required! Special Event admission applies: $8 Adults, $7 Seniors, $5 Children (3-15)... See you there! Join us this weekend for Diesel Day on Sunday, August 21!